Danger Club proposes a world where all the heroes are gone and all that are left are the sidekicks; and things do not end up pretty. After a long hiatus the bloody, violent, series about adolescents playing hero returns. Does it live up to the previous issues’ praise? Was the hiatus justified in an increase quality? Find out the answers to all these questions and more in your Major Spoilers review! Previously in Danger Club: Jack Fearless betrayed the team of rag tag sidekicks to the First President of the Global United States (and only remaining adult hero on Earth): The American Spirit. Danger Club, I have found, is best enjoyed when you can read chunks all at once. 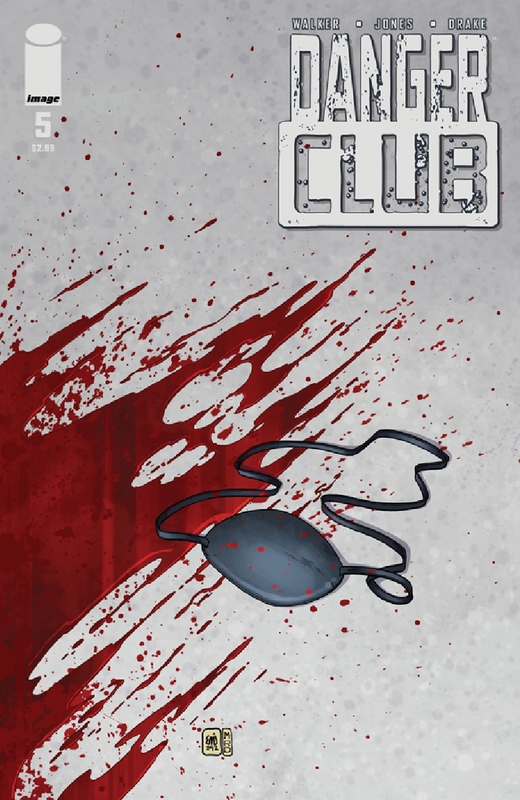 That being said, Danger Club #5 is still pretty good, but just feels like a small sliver of a much bigger story. With the hiatus between issue four and issue five being as long as it was, I almost forgot all that had happen to lead up to this issue, which really undermined the emotional significance that this issue should have, since it contained some rather important events. The characterization was strong enough, however, that I was able to re-invest myself into the characters by the end of the issue; but it would have been better if I read this along with the first four in rapid succession. I am surprised just how much they were able to fit in this issue’s twenty-two pages, it really felt like I got my money’s worth. A chunk of the happenings in this book were due to some exposition by the antagonist, in which he basically explains his evil master plan; which was a bit dull and dragged on a bit, but overall the book moved at a pretty great pace. This issue also continues the series overall feeling of desperateness from the protagonists, something that keeps me coming back for more. The art in this series has been, and continues to be, just excellent. I do not know what exactly about the art appeals to me so much, I think perhaps the fact it is sort of in this hyper modern age style, which just really sets the tone for the entire book in the perfect way. This issue is especially great, with some really stand out facial expressions that just make a few scenes really shine. Does this live up to its predecessors in terms of quality? Yes. Was it worth the long wait between issues? Yes. Did this issue end on a cliffhanger that left me wanting more? Yes. Should you, faithful Spoilerite, spare yourselves the pain and just read this in trade formate? Oh, hell yes.